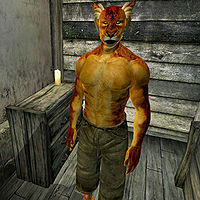 R'vanni is an extremely humble Khajiit pauper and skooma junkie living in Bravil’s infamous Skooma Den in the southeastern part of town. He does not want any trouble. He just wants his sweet skooma. He sleeps in the upstairs area every night between midnight and 6am. He starts the day with two hours without skooma, but at 8am he pulls out the bottle and starts drinking with the other addicts. He keeps going for a whopping twelve hours until 8pm, when he just staggers around the Den until his bedtime at midnight. Addicted to the point where he no longer cares, R'vanni staggers around the Den wearing only a pair of sack cloth pants. He carries around his stash of skooma (8 bottles), a few gold coins and his indispensable mug. It may be the skooma talking, but he is very keen on avoiding conflicts. When he greets you, he will say; "What you want? It's okay. R'vanni doesn't mind. R'vanni likes it..." And when asked about Bravil he will desperately try to calm you down: "R'vanni just wants to get along. No trouble. Anything you want. R'vanni's know-nothing, good-for-nothing. Ask anyone. Just don't hurt R'vanni." Like all other inhabitants of the Skooma Den, R'vanni can be killed without incurring a bounty as long as no other people (besides the other skooma addicts) are around. This is a great way to join the Dark Brotherhood.